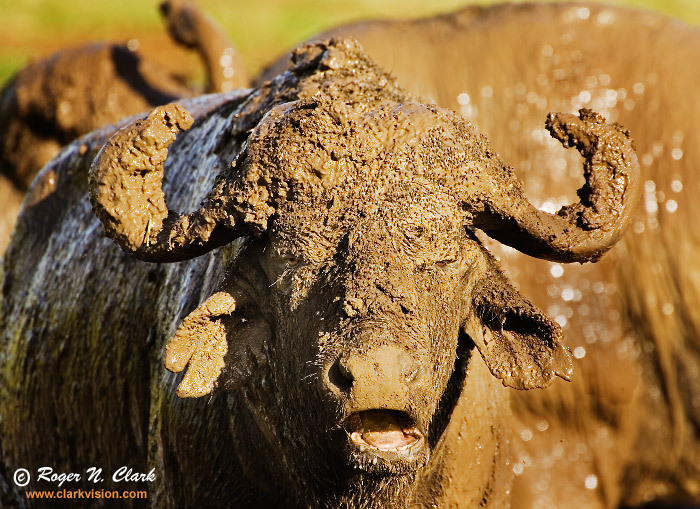 This cape buffalo covered himself in mud to protect him from the flies. The small black dots on his head are flies (the flies wings are resolved in the full resolution image). Ngorongoro Crater, Tanzania, Africa. Technical: Canon 500 mm f/4 L IS lens plus a 1.4x teleconverter giving 700 mm at f/5.6. Exposure: 1/250 second at ISO 100. Full height image, crop horizontal.